Book a Complimentary Coaching Session Now! Self-esteem is a realistic, appreciative opinion of oneself. Realistic means that we are accurately aware of our strengths and weaknesses. Appreciative means that we have overall good feelings about the person that we see. It’s about feeling whole and secure in oneself. The way you treat yourself sets the standard for others. The strongest single factor in acquiring abundance is self-esteem: believing you can do it, believing you deserve it, believing you will get it. People are motivated to have high self-esteem, and having it indicates positive self-regard. There is overwhelming evidence that the higher the level of self-esteem, the more likely one will treat others with respect, kindness, and generosity. People who do not experience self-love have little capacity to love others. Do you like and accept yourself? Are you happy with whom you are? Do you have faith in yourself? Do you believe that you have what it takes to be able to lead a rich and fulfilling life? These questions are all related to your level of self-esteem. I like myself as a person. I’m as good as everyone else. I like what I see in the mirror. I am happy to be me. I’m not affected by what others say to me. I have the skills and qualities to make myself a success. I’m not afraid to make mistakes. I can laugh at myself. Here are some ways to boost your self-esteem. The basic premise of self-esteem is that all people have intrinsic worth as a person which does not have to be earned. Intrinsic self worth is basically self love. When you feel intrinsic self worth, you are happy and satisfied with yourself as you are. Someone with intrinsic self worth does not require external awards, kudos, gold stars, or the acknowledgement of authority figures (parents, priests, teachers, etc.) in order to feel good about themselves. Someone with intrinsic self worth loves themselves unconditionally. This core human worth is not affected by external factors, this means that you don’t need to compete in order to establish your worth, or be constantly comparing yourself to others with money, looks or physical things. 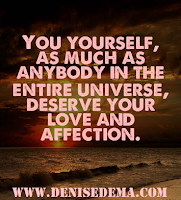 It means that your self-esteem is not something that is developed by any external factors. One of the building blocks of self-esteem is recognizing your intrinsic self-worth. Seek respect mainly from thyself, for it comes first from within. Self-esteem and circumstances are only indirectly related. Self-esteem is 100% determined by your thoughts. One example to illustrate this point is what you say to yourself when you’re standing in front of a mirror. If you look in the mirror and think, “I’ve gained five pounds; I look fat”, you feel bad about yourself. If, instead, you think about something positive, “My hair looks nice like this”, you then feel good about yourself. The reflection in the mirror remains the same; only the thoughts change. If you’re the vice-president of a major corporation and you say to yourself, “By my age I should be the President of this corporation”, you feel bad about yourself even though you hold an important position. If, on the other hand, you hold a job that is not regarded by society with as much prestige but you say to yourself, “I do my job well and it allows me to pay my bills on time and spend quality time with my family which is my priority”, you feel good about yourself. You can increase your self-esteem by changing the way in which you interpret your life, and by uncovering the negative self-statements you habitually make. You then need to create new, positive self-statements. They add that research indicates that it is more effective to stop telling yourself negative things, than to just tell yourself positive things. 1. Pay attention to your thoughts and learn to become aware of when your inner critic is doing the talking inside your head. 2. When you hear the inner critic, talk back. You can mentally say to yourself any of the following: “That’s a lie”; “Shut-up!”; “I don’t believe that”; or “That’s not so”. You can also wear a rubber band around your wrist and snap it when you hear the inner critic talking, in order to break your chain of thought. 3. Instead of being occupied with thoughts about past occurrences which may result in feelings of anxiety, sadness, regret, shame, or guilt, based on what your inner critic is saying, get up and go do something else. You can also shift your attention: look out the window, look at an object nearby and study it intently, think of something pleasant you’ve done lately, or think of someone you enjoy spending time with. 4. Schedule time to address the things you need to think about or figure out. If there’s something that’s not resolved, set aside a specific time to think about it. Then, only think about it during that designated time. If you catch your inner critic trying to get you to think about things prematurely that interrupt your day, stop the thoughts and make it wait so it has a place and time instead of allowing it to rummage through your head the entire day. Worrying about things with no result in sight only disrupts your ability to focus on other things that are important. 5. Replace the inner critic with a positive voice. Compliment yourself or repeat a positive affirmation. Stop the thoughts that are negative and replace them with good thoughts to create a habit that will become second nature in time. Self-esteem is a mental muscle that must be developed and maintained through regular psychological workouts. Here are some of the “workouts” recommended. 1. Pursue something you’re passionate about each day, even if it’s just for fifteen minutes. This can be gardening, hitting golf balls, taking a walk at the beach, reading a chapter in a book or reading a bedtime story to your child over the phone if you have to work late. Actively seek out activities and projects that generate passion. 2. Instead of just giving yourself credit only when you achieve a goal, stop to recognize your efforts. Make a list of things that you give your 100% to. 3. Put up a self-esteem bulletin board in a place where you can see it often and fill it with things that make you feel good: an email from a client thanking you for your great work, a photo of yourself that you like, a painting your child made especially for you, and so on. Update your collection once a month. This is a visual aid that does wonders for your mental state of mind each day when you see it. It sets a positive path for you. 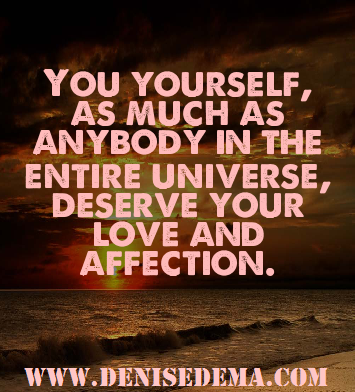 The reputation you have with yourself - your self-esteem - is the single most important factor for a fulfilling life. Get the tools you need to excel in your life by working with a Business and Life Management Coach who has over 20 years experience empowering people to attain self-defined success in their professional & personal lives. 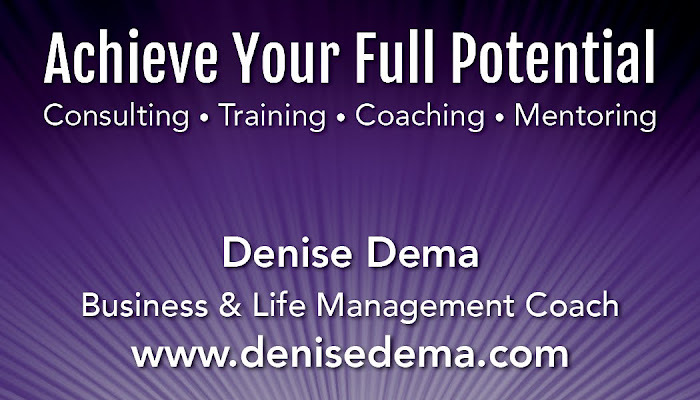 Book a complimentary session at http://www.denisedema.com to get started in reaching your personal and professional goals today! On-site, phone, e-mail coaching available. Expand your knowledge and enlighten your mind with the tools you need to excel in your personal and professional life! Book a free session to start reaching your goals today! "Just Ask D" questions pertaining to life's challenges, business growth, career direction, healthy relationships or anything that you want guidance, information or feedback on. Contact me now! Stop Over Analyzing and Live Life! Check out my comments at the end of the Palm Beach Post article, "Invention and reinvention for mother and son." Learn The Skills Of Highly Effective Job Seekers.